Give your Butterfly Themed Party guests a jar full of treats and special memories with exciting jar favors. Here is your chance to put your own finishing touches on personalized favors that are useful, fun and sure to leave a lasting impression. And your guests won't be able to resist! Each reusable glass jar measures 2.75 x 1.75 and has the classic candy/cookie jar shape with a silver metal screw on lid that showcases your personalized label. 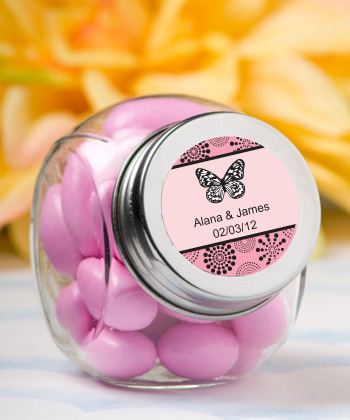 From assorted color combinations, to adorable themed designs that match your occasion, to your own name and date, you can personalize your label and fill the jar with any number of treats to make it a unique memento of your special day. Personalized labels are self-sticking for easy assembly once jars have been filled. A one-of-a-kind sensation, exciting jars come bulk packaged...Please allow 3-4 business days for production...The candy shown is NOT included.